Daniel Owen was born at Cadnant, in the parish of Llandysilio at the point when 1809 turned into 1810. He was baptised on the 7th. of January 1810, the youngest of the five known children of John and Elinor Owen. The other children were: Herodias, (baptised 29th. of October 1801); Mary, (16th. of October 1803); Daniel, (28th. of February 1808); and Ellin, (11th. of June 1809). premises on the far right, with the sun canopy. 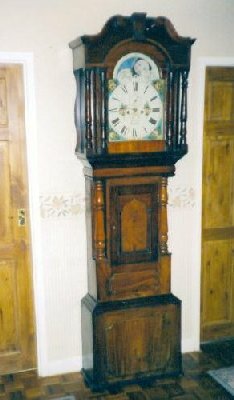 It is not certain when he came to live at Carnarvon, and it is equally uncertain whether he served his apprenticeship with one of the Carnarvon clockmakers, or if he was already qualified when he arrived. What is certain is that he was a Watch & Clock Maker in his own right by early 1835, his occupation being recorded so in the Pendref Independent Chapel registers. Daniel married Charlotte Morris on the 12th. of April, 1831 at Llanbeblig Church, Carnarvon. Charlotte is something of an unknown quantity; her birthplace is rather a mystery, being recorded as "Not Born in Same County" in 1841. According to the 1851 and 1871 census returns she was born at Carnarvon, while in 1861 it was Cerrig y Drudion, Denbighshire. Finally, in 1881 she was down as having been born in Derby. The first-born child was a son, John, who was baptised on the 15th. of July, 1832, at Llanbeblig Church. Sadly, John died at the age of 12 days, being buried at Llanbeblig on the 20th. of July 1832. "Annah the Daughter of Daniel Owen, Clockmaker, Carnarvon in the Parish of Llanbeblig by Charlotte (formerly Morris) his wife born August 12, 1833 and was baptized February 15, 1835, by me Wm. Williams"
Daniel's occupation in the two register entries clearly indicates that he was a Clockmaker, but as there is no mention of him in the Pigot's Directory of 1835, it seems to indicate that he was still employed by another Clockmaker and not in business on his own. By 1841, and census night, Daniel was listed as a Watchmaker at Eastgate Street, and he makes his first appearance in a Carnarvon Directory as a Watch & Clock Maker in Pigot's Directory of 1844, also at Eastgate Street. He was subsequently listed in both the 1850 and 1858 directories at the same address. 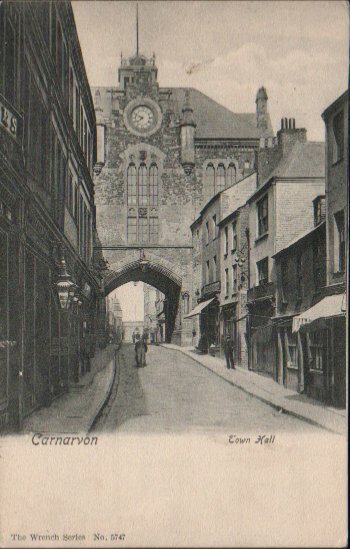 Between 1858 and 1861, Daniel had moved from Eastgate Street, and on census night 1861 he was in High Street. It is possible by comparing his neighbours on the night to work out that he was in fact at No. 42, on the corner of Hole in the Wall Street. Daniel's next move was leave Carnarvon and start afresh at Criccieth. 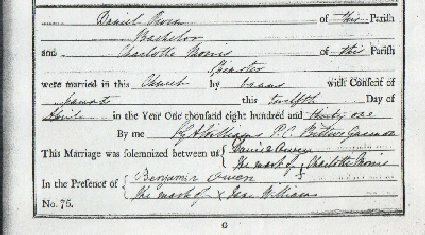 It is difficult to pinpoint the exact date he moved, but he is listed in Slater's Directory of 1868 at Criccieth, and on the 1871 census he is recorded as living above his shop at Greenwich House, Union Row, which at the time was part of the High Street, next door to the Prince of Wales public house. His son John was by now a Watchmaker in his own right, working with his father in the family business. 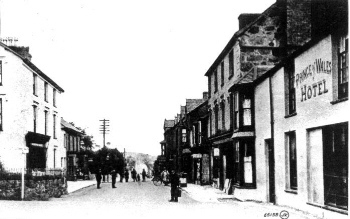 The last recordings of Daniel were in the Slater's Directory of 1880, and the 1881 census, both at Union Row, Criccieth. Daniel Owen died on the 25th. of August 1881, at the age of 71. Daniel's death was reported in "Y Genedl Gymreig" on the 8th. of September, and it describes how he had not been in the best of health for a few months previous to his death, but had not let it affect his every day life and work. His passing came suddenly and unexpectedly, when he collapsed as he was getting ready for bed one night. All attempts to resuscitate him failed. According to his death certificate, he died of "Valvular Disease of the heart", which would seemingly explain his recent ill-health. He was buried at Llanbeblig on the 30th. of August, probably with his young son, John, who had died nearly fifty years previously. Charlotte survived her husband by less than a year, passing away on the 29th. of July 1882, and was buried with Daniel on the 1st. of August. Sadly it appears that their grave is unmarked. 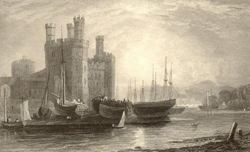 In Daniel's will, the business was left to his son John, who carried on with the trade at Criccieth for a while. He married Mary Edwards in 1882, at Rusholme near Manchester. Mary was a Flintshire girl who was in service at Rusholme, and the ceremony was probably conducted here for convenience, (and residential qualifications), as John was still in business at Criccieth at the time. In 1883 a son, Daniel, was born. By the time Porter's Directory of 1886 appeared, John had quietly slipped out of the listings, eventually ending up at Little Sutton, near Chester, at the time of the 1901 census. He was then a widower, living at lodgings with his son Daniel. When Daniel married in 1915, John was noted as deceased on the marriage certificate. And so a family business which had been established for nigh on a hundred years came to an end. On Daniel and Charlotte's marriage entry in the Llanbeblig register, one of the witnesses was a Benjamin Owen. Interestingly, on the 1861 census, when Daniel was living at 42 High Street, five doors down at No. 32 was Benjamin Owen, aged 53, a butcher. According to the census, Benjamin was born at Llandisilio, Anglesey. Seemingly a family connection? Many thanks to Andy Hollister for sharing some of his research into his family history. You can contact Andy at: a.d.hollister@sky.com He would be pleased to hear from anybody with further information about Daniel Owen.